You're most likely to be a descendant of Maleficent! You’re definitely a complicated person, and people’s first impressions of you are often wrong. You’re cunning and passionate, and things can get fiery when you’re mad. People are best not to betray you, because you’re not quick to forgive them when you’ve been wronged! You're most likely to be a descendant of Jafar! You’re likely sly and intelligent, and you aspire to be a very powerful person. When you want to achieve something, you’re willing to take the time to map out the perfect plan. Even if your attentions aren’t ALWAYS pure, people do tend to trust you. You’ve got a bit of magic in those hands! 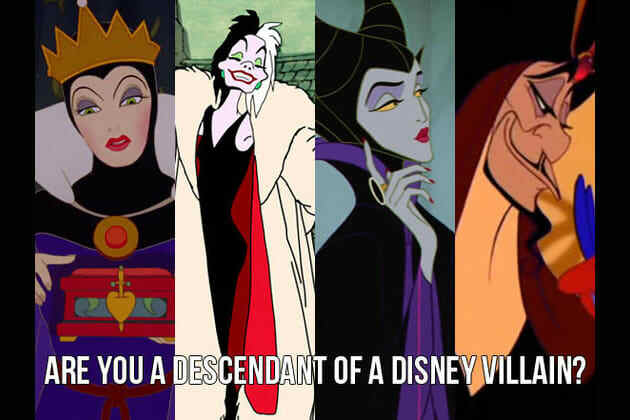 You're most likely to be a descendant of the Evil Queen! Even though you’re drop dead gorgeous, you don’t know just how beautiful you are. You might compare yourself often to others, and can even get jealous when they have certain traits that you don’t. With a little confidence, you can let all of that negativity slide and be the fabulous person you are! You're most likely to be a descendant of Cruella de Vil! First and foremost, you’re a major fashionista. You’ll go to any lengths for style, and you always look fierce and fabulous because of it. Sometimes, you may even pay so much attention to what you wear that other areas of your life can suffer because of it. Try not to let this happen, but stay stylish! The latest Disney Channel Original Movie, Descendants, follows the lives of the teen offspring of villains like Maleficent and Jafar. Take this quiz to find out which Disney villain would be your mom or dad!